Today’s 8am to 2pm, 3/4 day trip was another good one. The weather was not perfect, with 15kts of southerly wind and around 3ft seas. 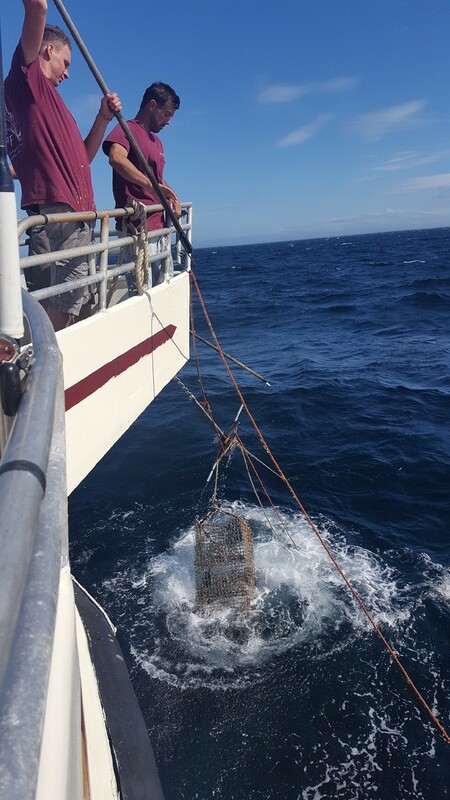 But despite the weather, the Lady Sea produced over 60 keepers. The good haddock fishing to the east continued, complimented by a decent amount of Pollack and red fish. The best part, no dogs to be seen. Check the schedule on the website and get out here soon, the end of the season is coming quickly. Today’s all day trip was a mix and match pick of a day. 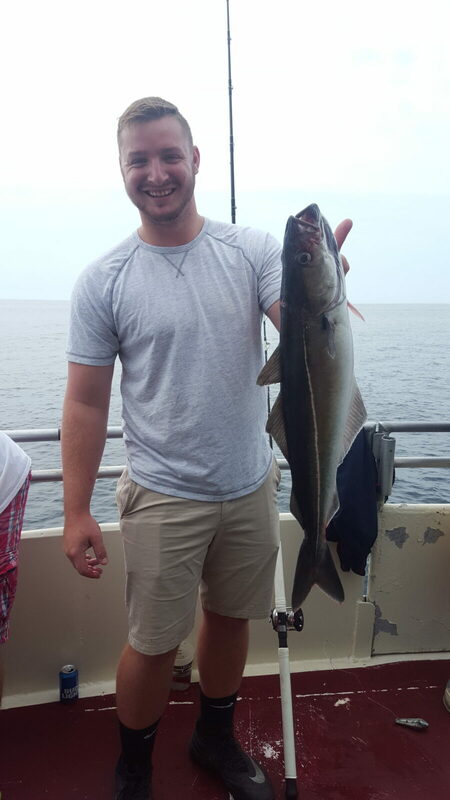 We started off in shallow water just short of Tillies, and caught some decent haddock at a slow pace. Throughout the day, we moved south and east, trying 5 different stops. Pollack and cusk made up the rest of the days catch, along with 2 wolf fish, around 20 lbs that were released. With around 120 keepers and beautiful weather, the day was a success. Check out our schedule, and come on out before the haddock season comes to a close in mid September. August fishing at it’s finest. The weather has been calm, the sun has been hot, and the fishing has been good. Some trips have been more productive than others, but overall, we have been getting a nice pick of haddock, cusk, pollock and redfish. The dog fish problem from a couple weeks ago seem to have subsided, though we still get a few, it’s much more manageable. The number of big cod have also dwindled as they seek shelter in the cooler deep water before the fall spawning season. 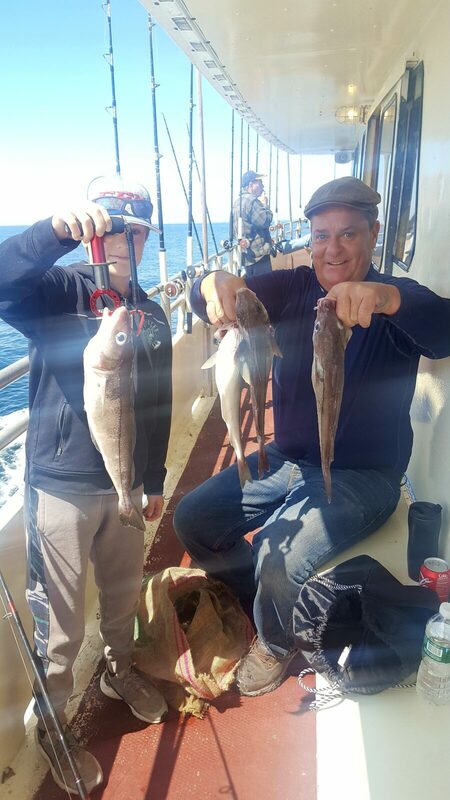 As is usually the case in August, the fish spread out, the balls of bait disperse and we all think about how great the spring haddock fishing was. We should expect to see more blue sharks in the coming weeks which can pose another challenge. Bait still rules over jigs. Cool sightings this week include ocean sunfish, dolphins, football size tuna busting the surface, and a leatherback turtle swimming like he just escaped the aquarium. The best part of summer fishing, you never know what you will see next. A cool overcast day with a few sprinkles and a brisk SW breeze greeted us in Gloucester Harbor as we passed through the Blyman cut bridge. It was a comfortable day, though some patrons were yearning for warmer weather that didn’t come. I would say some were slightly under dressed for the weather, but toughed it out. The fishing was very good all day with a steady pick of all species. Keeper haddock, pollock and cusk. A 9 lb cusk was our largest fish of the day, not including the 12 lb cod and a hundred or so big dog fish that were caught and released. Busy day on deck for the crew, fighting through the dog fish, dealing with the moon current tangles, and keeping everyone fishing. Some people had big full burlaps, others had a few to take home, and some were just snake bit by dog fish. I saw a few double header dog fish come over the rail which is just another reason to fish 1 hook this time of year. We had our first blue shark sighting of the year, so we are almost in full August mode. There is a ton of life on the all day fishing grounds, it just takes a little luck and a ton of work to fight through the dogs. Saturday July 22nd, 3/4 Day and Half Day Fishing. The morning was a typical 3/4 day trip with a variety of fish coming over the rail at a steady pace. 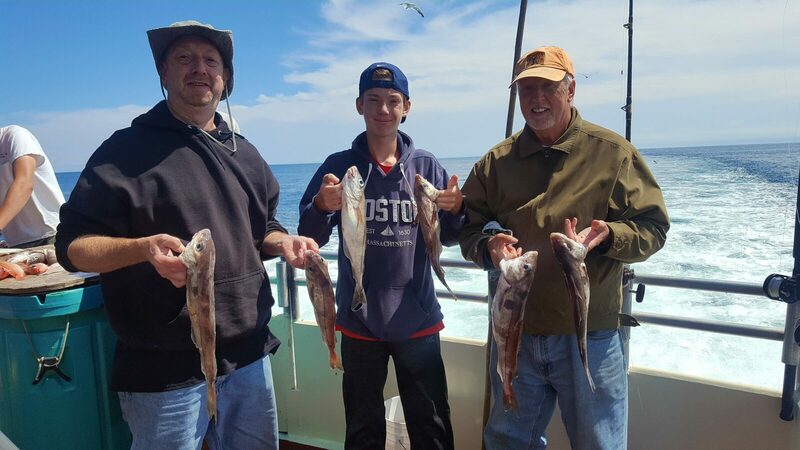 Again, we were haunted by the dog fish but we were able to get some of the targeted fish on the deck including haddock, cusk, Pollock and red fish. An 8lb Pollock stole the pool from a 6 lb cusk. By the way, the stretch of weather we have been having may be decreasing the bite a little, but has been perfect for going fishing. The afternoon 1/2 day trip was a charter and the weather couldn’t have been more favorable for a boat ride. The inshore 1/2 day grounds have not been very productive the last few trips, so we decided to go back to where we had fished in the morning in hopes of the bite still being there. It’s a little longer steam, but is usually worth it. We were drift fishing, so we had a few more tangles, but the dog fish were not too bad. The short duration of a half day trip does not allow for much scouting and searching, as luck would have it on the day, the fish just weren’t interested in our offering in the afternoon. We scraped up a few fish, mostly red fish. Just as a public service announcement to all that sailed with us Saturday. There is always something with a boat! Thank you for your patience, we discovered a small leak in our generator that limited our use of electricity, though all the necessary electronics were unaffected, the ‘luxury’ items such as the microwave, beer cooler, saltwater hose pump, and toilet flushing abilities were impacted. The crew did a great job improvising to limit customer impact and the trips went with out a hitch. This issue did not have any impact on our fishing, our safety, or ability to service the customer. Thanks again for being patient. The problem has been resolved. We had two trips scheduled with 3/4 full boats for both trips. When we left the dock, everything seemed fine, but once we got around the break water, we were greeted by a steady NE wind of 15 knots with a sea that had built to over 4 feet. This is fish-able and some boats did very well as it was a great jigging and biting wind. Our customers were not that thrilled with the adventure, so we packed it in early and canceled the afternoon trip. Four feet is not bad, but the spacing of the waves were only 5-6 seconds which compounds the discomfort. We took a hit financially, but for the experience, enjoyment and comfort, we made the right decision for the customer. Thursday, July 20Tth Who Let The Dogs Out?!? Today we had a 3/4 day fishing trip charter with beautiful weather once again. The ocean was like glass, very light winds and warm temperatures. The fishing was tough. 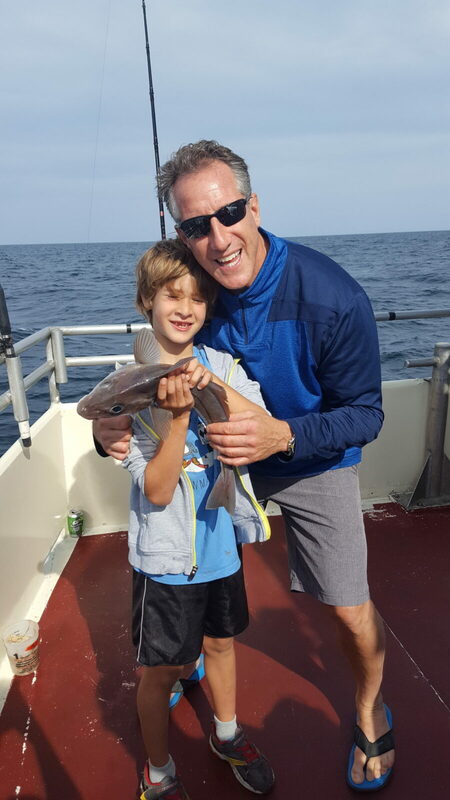 There were plenty of fish to be caught, but getting through the dog fish was a great challenge. We managed to get some haddock, a nice cusk and a nice Pollock, but the dogs proved to win todays battle. We made a number of moves, but the dogs kept right with us, such can be summer fishing. A suggestion to all, it’s the time of year where we recommend 1 hook fishing. Fishing 2 hooks results in an increased number of tangles, increased chance of dog fish, which results in damaged terminal gear and lost fishing time. FOR RESERVATIONS PLEASE CALL 978 559 1978. Friday’s, July 14th, full day trip was very, very good. Constant action all day. The forecast was for possible showers, it turned out to be overcast all day with light winds. The current was kind of strange, but manageable. We had a number of experienced anglers today that did very well, at least one fish per drop, I believe one person had a total of 21 keepers. 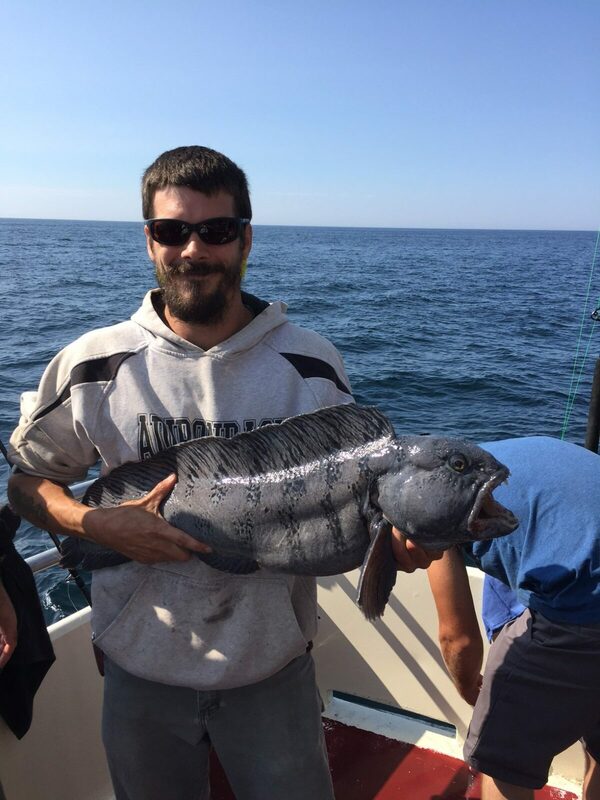 Haddock, cusk and Pollock made up the keeper catch with a cusk taking pool honors. Saturday, July 15th, we were hosts to an all day company charter. The ocean was greasy calm with light winds and warmer conditions. The catch rate was down significantly from Friday’s trip. The last stop provided half the days total keeper catch. Again a cusk took pool honors. Dog fish played a much larger role in reducing the keeper catch, and we had to make a number of moves to stay ahead of them. Fun day had by all. 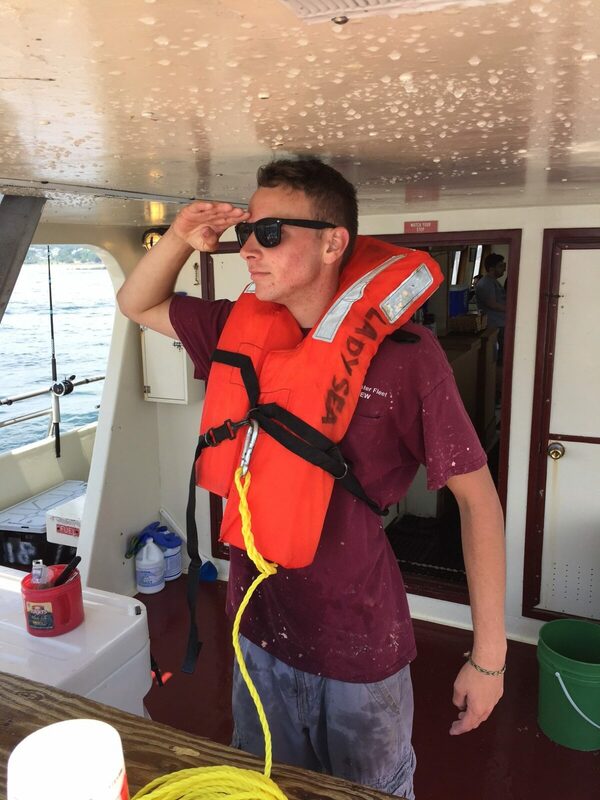 Hi Carolann…..I just wanted to take a minute to thank you guys for the great day on the water Saturday! You have an excellent team in place! The gang on the boat was great!!! Super friendly, very helpful and they showed a great deal of patience in dealing with our group! Your team was very professional! I am looking forward to the next time my company gives me the ok to book another trip! I wouldn’t call anybody else but you guys! Thanks again and hope to see you guys again soon! Sunday, July 16th, surprisingly, we did not have enough interest to run a 3/4 day trip, but we had plenty for the afternoon half day trip. The fishing was good. We had to work at it. It was one of those days where you catch haddock, but quickly get run over by dog fish, so we had to make a number of moves. We got some decent haddock, a few mud hake, whiting, and a 10 lb wolf fish. And probably close to 100 dog fish and a handful of cod up to 8 pounds. For reservations,please call us at 978 559 1978. Summer schedule had us run two 3/4 day trips and one 1/2 day trip. Except for a quick squall at the end of Saturday afternoon’s trip, it was perfect weather to be on the ocean.The fishing was steady on all trips with a mix of everything. We had very nice haddock, a couple red fish, and a couple cusk for keepers. Unfortunately, we saw a bunch of good size cod up to 12 lbs, a 14 lb wolf fish, and many large dog fish. On Sunday, the dog fish were so ravenous, we would move, pick some fish and get dogged. Many haddock came to the surface with bite marks or partially eaten, not to mention the damage they did to the terminal tackle. Sunday was by far, the worst dog fish show of the year, hopefully they are just passing through. For reservations please call us at 978 559 1978. Last week all day fishing trips did very well with a mix of haddock, cusk, pollock, and red fish. The beauty of fishing the deeper water is the mixed bag of fish captured. 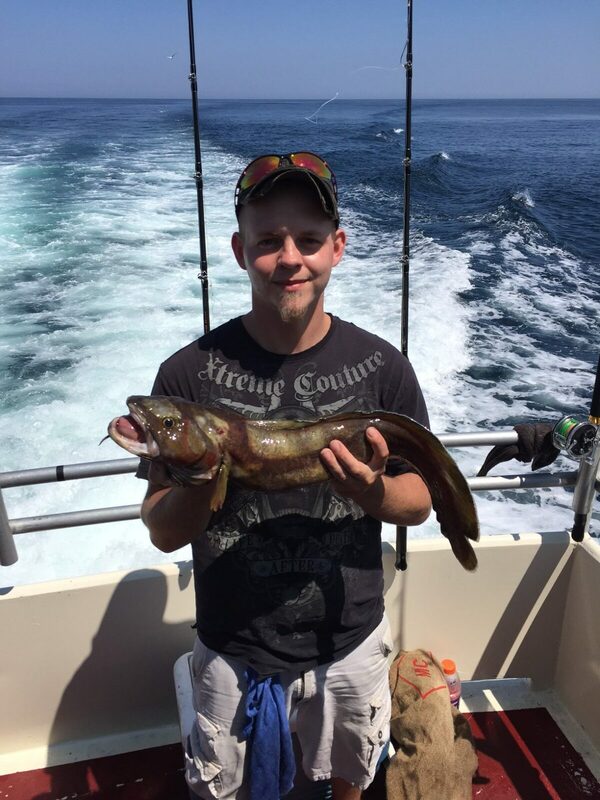 We also caught and released a great number of cod up to 15 lbs. Dog fish are around. 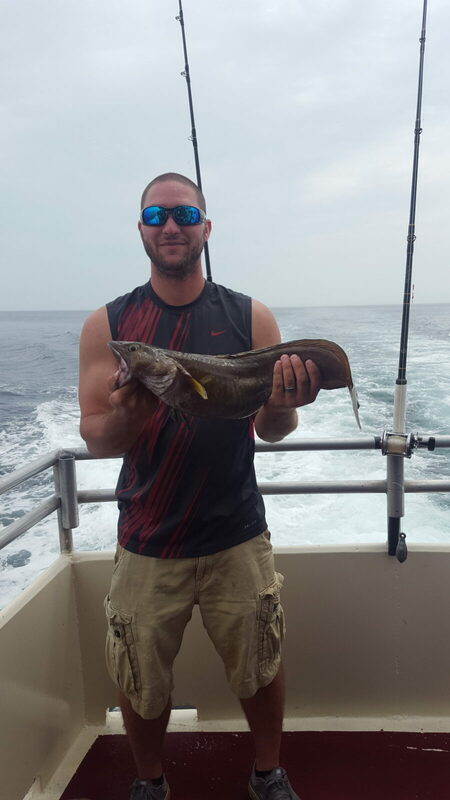 Cod and dogs reduced the legal fish catch, but the cod are fun to catch non the less. The catch was good today. When the bags arrived at the filet table, there were more keepers than I had noticed during the fishing. A pleasant surprise. Most fish caught were cod and dog fish, which were released unharmed. Haddock led the way for keepers followed by pollock, cusk and red fish. A 6 lb Pollock won the pool, though I believe a slightly larger fish in the form of a cusk was boated by an angler not in the pool. This trip had a dark cloud over it from the beginning. We had 3 groups of anglers show up late, we usually don’t hold the boat, but we were in constant contact with them and didn’t feel right about leaving them behind. For the next several days, we will be putting the fishing gear away and making our way to Bristol RI for the 4th of July festivities where the Lady Sea will work for the US Navy as a tender boat for the crew of The USS FARRAGUT, an Arleigh Burke Class guided missile destroyer fitted with the latest technology to fulfill any assigned offensive or defensive tasking. Commissioned on June 10, 2006 she is named in honor of the US Navy’s first Admiral, David Glasgow Farragut and is the 5th ship to bear his name.